Everyone needs one meal that can be whipped together that everyone loves. 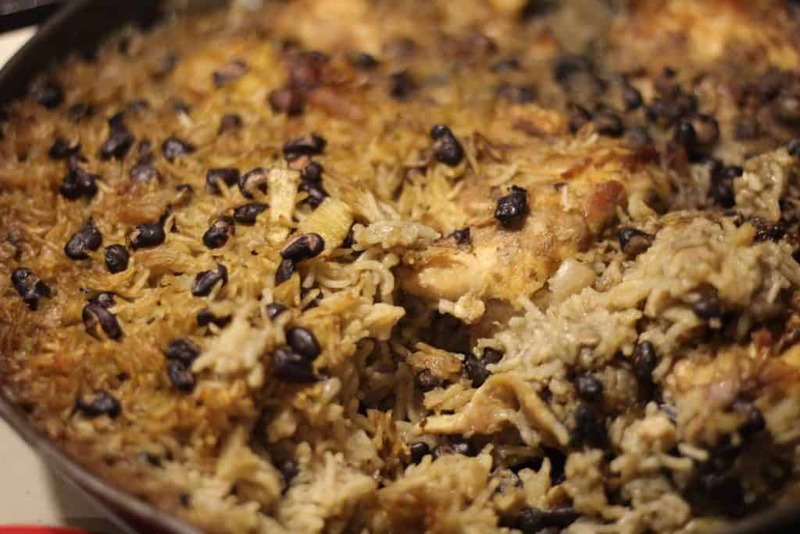 Mine is a rice and bean bake, with chicken added on top. My aunty Carol thought this to my dad when he was in college. It was his survival meal that even a college bachelor could make! It’s done baking in one hour. The house smells awesome. And everyone likes it. 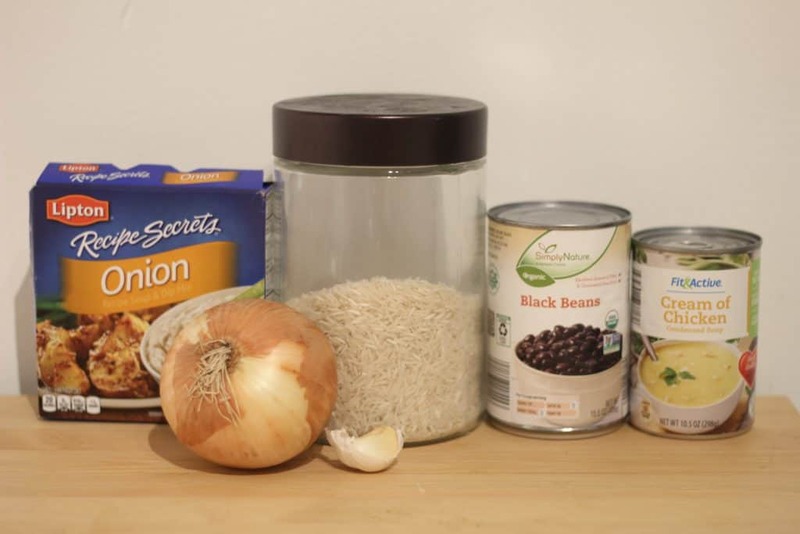 So here’s How to make the tastiest rice and bean meal with one pan. Note: My large 12 inch cast iron pan is one of the most used things in my kitchen. If you are busy and need an all purpose pan, this is perfect. We use it for casseroles, meat, stir fry, and you can be sure that you will get that extra pop of iron in your diet! First set oven to 350 degrees. 6 chicken thighs, or any meat you have on hand. Heat oven to 350. Get out a cast iron pan. I recommend this one, as it’s large enough and comes with a handle cover! 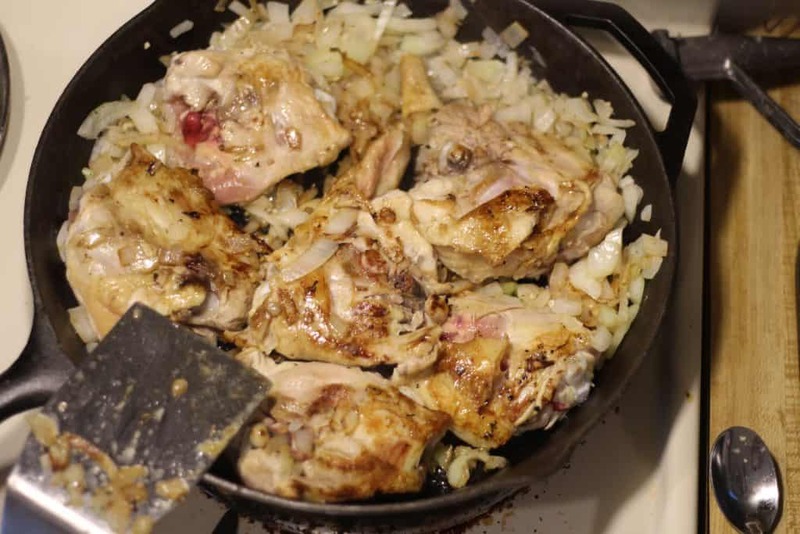 Put a Tablespoon or two of oil in the pan, and cook the onions and garlic until fragrant and soft. Then add the chicken and brown on both sides for about 5 minutes. I’ve skipped this step and just added everything without browning. It still tastes really good! It’s just not AS good. Turn off the burner, and add everything else. Stir in the cream of chicken can as best as possible, or it will kind of bake in chunks. Sprinkle with pepper and toss in the oven for 1 hour uncovered. Note: It’s easy to sub cream of mushroom or cream of anything if you want. The top is bubbling and slightly crispy brown! 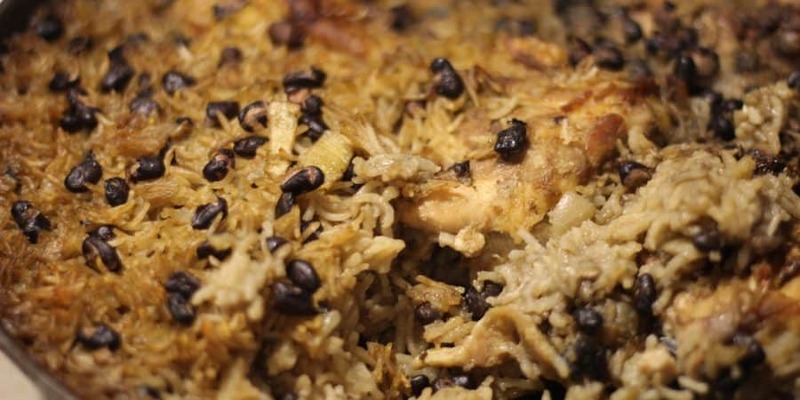 This dish is amazing because the rice and beans taste SO good. It’s the perfect mix of salty and savory. 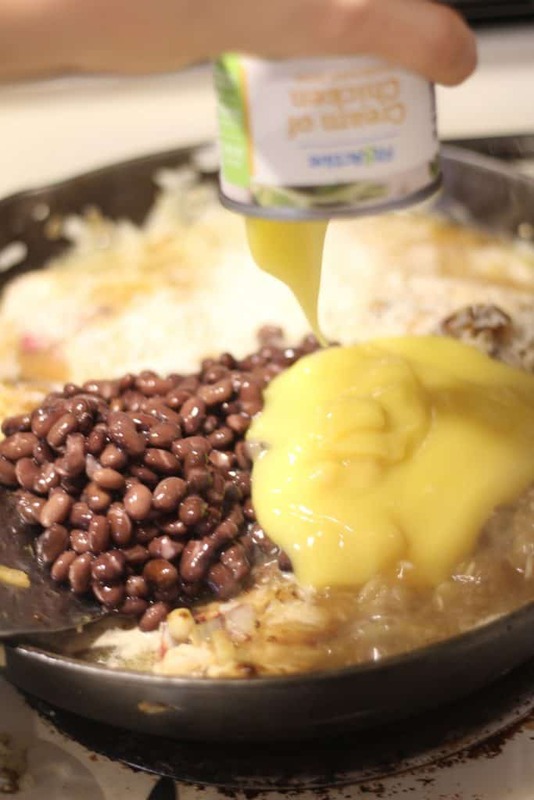 You could just do rice and beans with no meat, and instead add another can of beans for protein and it would taste really good. But it would not have the yummy fat dripping flavor. If you don’t have fresh onion and garlic then add 1 tablespoon of onion powder, and 1/2 teaspoon of garlic powder extra. This meal would be perfect to bring to a new mom, or to someone after they’ve had surgery, as it’s hearty and makes great leftovers. ENJOY! Let me know if you make it for the first time! All of the ingredients except the meat of your choice. First put a dab of oil in the pan and sauté the onions and garlic till soft and fragrant. Then I push the onions and garlic to the sides and add the meat to brown. Just cook on medium high for about 5 minutes and then flip for another 5 minutes. It should look like this. You can actually skip browning the meat but I think the flavor is SO much better if you do this step. 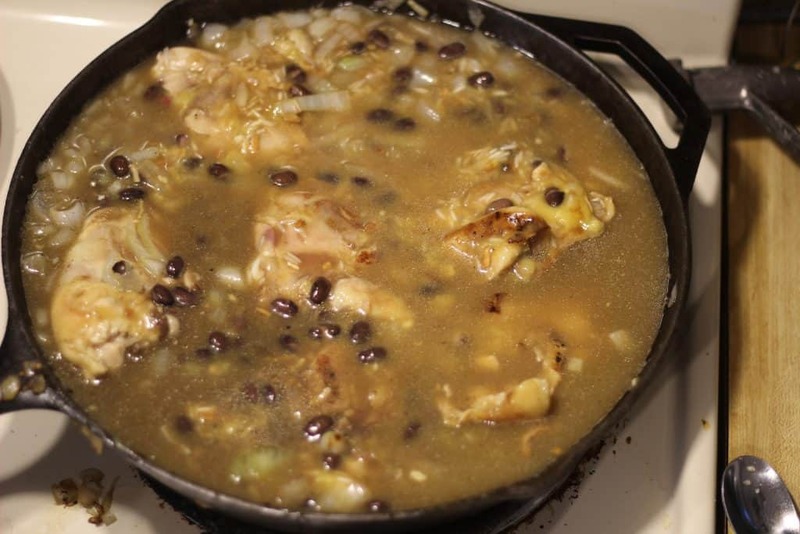 Add the rice, water, beans, and cream of chicken. I did this all before stirring but honestly it can be a bit tricky to stir it all around the meat. It’s easier to just take out the partially cooked meat, stir in everything else, and then lay the meat back on top. Also add in the onion soup mix. Stir evenly as this is the salty part. Looks like this when everything is stirred together just before it goes into the oven. Any rice not under the chicken will stay hard so make sure the rice is in the water. Put this whole pan uncovered into the oven at 350 degrees for one hour, or until the top is browned and all the liquid is gone. I am obviously not a food photographer as we ate some before taking pics. But you get the idea of what it looks like here. This makes amazing leftovers and it’s easy to swap out the cuts of meat. We like chicken thighs or pork chops best.